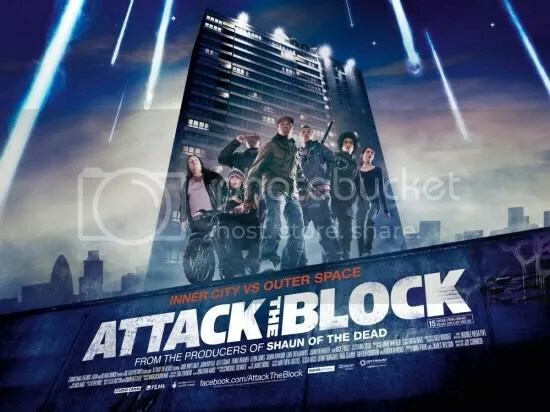 In Joe Cornish’s debut feature film, Attack the Block, aliens have suddenly begun to crash land on a South London estate, and following their first encounter with the inhabitants are definitely not coming in peace. It’s Bonfire Night, and nurse Sam (Jodie Whittaker) is walking home later than expected. Finishing a phone call she encounters one of those things we all dread in such occasions, a gang of rowdy youths blocking the road. She crosses over, some of them follow her, she decides to keep going when the leader of the gang approaches and asks for the phone, she hesitates and he releases a flick knife. Now he wants her purse, and her ring, but the ring won’t come off so he tries to force it and knocks Sam to the ground. Just then something appears to fall onto an adjacent car and explode. What was it, a firework maybe? The thugs approach but whatever it is wounds their leader and takes off, so off for revenge they go and our whole sorry tale begins. This film looks absolutely fantastic, and its direction is totally assured especially for a first time filmmaker. Technically speaking everything about it is impressive and Joe Cornish has definitely succeeded in transferring into a new medium with immense skill, marking himself out as someone to watch. However, there are times when the film does not quite come together, or perhaps just narrowly misses out on transcending good to great, notably the end which is very abrupt (but perhaps in keeping with the nature of the film). The cast of mostly unknowns who make up our group of anti-heroes all give very fine and convincing performances, especially Moses, the leader whose arc is most central to film, excellently played by John Boyega. The depiction of life on the estate feels very authentic, down to the inclusion of current street slang and the film avoids patronising either its characters or the audience with stereotypical or reactionary attributes. There are a few misfires, such as Luke Treadaway’s middle class stoner, loser, zoologist desperately trying to fit into this concrete jungle and ending up becoming a walking plot point and inconsistent comic relief. Similarly Nick Frost’s small role is sometimes more of a distraction than anything else. That said, this is definitely the most enjoyable and accomplished British film for quite some time. If it doesn’t quite live up to some of the hype it’s not through want of trying and it will be surprising if this doesn’t end up becoming another cult hit in years to come!